I have seen so many juice bars and smoothie cafes popping up lately, which for me is really exciting. I am certainly not opposed to food, but there are times when I’m on the go and just don’t want to stop and eat a salad. Anyone with me? It’s great that I can run in and grab some real “fast-food-in-a-cup” to drink my nutrition while I’m on the road. So yesterday, I stopped in to check out a new ‘Juice Bar’ as they called themselves on their sign. However, there was no actually juice available on the menu. Hmm. . . They had food and smoothies and shakes, but no juice. So I realized how much confusion there is on this topic, even amongst the industry itself. Let me break it down for you. Have you ever tasted fresh-squeezed orange juice? Then certainly you must have noticed how much more alive and delicious it tastes than say. . .Tropicana out of a carton. Fresh juice is full of living nutrients, enzymes and flavor. That’s because it hasn’t been cooked, pasteurized or frozen. The Mechanics of Juicing: Juicers receive the fruit or vegetable, usually into a shoot on the top, somehow separate the water (or juice) from the pulp (or fiber), and drain the juice out into a collection container for you to drink. (There are many types of juicers and extraction methods on the market that I won’t get into here, but I just wanted you to know that not all juicers are created equally and you can research that if you’re interested). You can juice fruit, vegetables, roots, leaves and sprouts. If your juicer is effective, it will yield both liquid juice and pulp in 2 separate containers. You drink the juice and either discard or get creative and use the pulp in some way. If you compost, you can definitely add your pulp to the bin. The advantage to juicing is that these living nutrients will easily absorb into your blood stream through your stomach lining. Juice isn’t very filling, but it’s de-li-cious and packed with nutrition. Now when I say blender, I’m actually referring to a high-powered blending machine such as a Vitamix or BlendTec. If you’ve ever been places like Juice it Up or Jamba Juice, this is similar to what they use. Again, there are many to choose from. But that is content for another article. You may be able to get away with using a regular blender, but sometimes it can be a bit much for a kitchen blender to break down whole fruits and vegetables into a smoothie. The high-powered ones I’m talking about will literally pulverize anything raw (even raw broccoli) into liquid in mere seconds. Fascinating to watch. . . 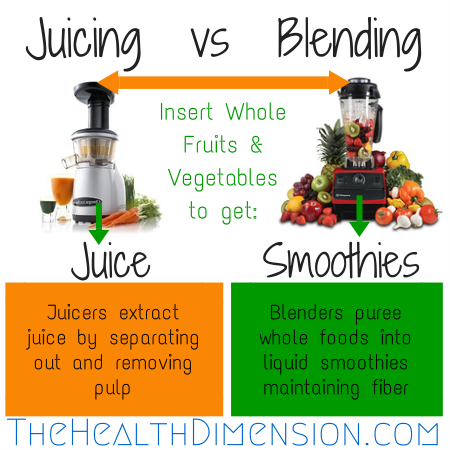 The Mechanics of Blending: Just like with a regular blender that you’d use to make a margarita or something, you add your fruits, vegetables and liquid if you’re using any into the blender container, secure the lid (make SURE you secure the lid) and turn on the blender. It will puree the contents into a thick delicious smoothie or shake, depending on your ingredients. Everything stays in the container and blends together, maintaining the fiber or pulp along with the juice. It is poured out into a glass for you to drink. The advantage to blending is that you’re essentially creating a meal in a cup. You’re keeping the fiber IN the final product, and you’re not losing any of the juice or nutrition that can’t be extracted from a juicer. Either way, I highly recommend consuming your fresh juice or smoothie immediately upon making it, if possible. The longer it is exposed to air, the more it oxidizes and the less available the nutritional content becomes. But hey, it’s a busy life out there. So if you make a smoothie and bring it to work with you for later, at least you’re getting whole food nutrition that tastes great and is way better than the drive-through. Well, I hope that clears up a few mysteries of the juicing world. Have fun with it and let me know how it goes!